Last week I didn't plan what I was cooking for the weekend entirely, instead I decided to head down to the Santa Monica Farmers Market and see what in-season vegetables and fruit looked good. There was a lot! Citrus fruits, squash, heirloom carrots, radishes with cool patterns, cauliflower, broccoli, assorted leafy vegetables, fragrant herbs, bright flowers and much more. My guests on Saturday got a very colourful meal! One comment was that it was a "very Californian meal" because of all the veggies! I steamed the purple cauliflower and served it with the radishes and some peppers to go with lemon parsley hummus and also a roasted eggplant dip. The variety of carrots were made into a yummy salad that A Cozy Kitchen posted the other week. The tomatoes and the lettuce were made into a simple salad with a drizzle of balsamic vinegar, a sprinkle of salt and pepper, just enough to enhance the flavour of the tomatoes whilst not ruining the delicate lettuce leaves. The grapefruit was a great afternoon snack, it was juicy and sweet! And we enjoyed the strawberries too. The coloured mix of potatoes is for another night, will probably season with some salt and rosemary, roast and serve with some chicken or salmon. These images are barely enhanced (I did some minor adjustments lighten the pictures), you're seeing actual colours! How amazing is nature. My conclusion after that outing? Farmer's Market = healthiest retail therapy! 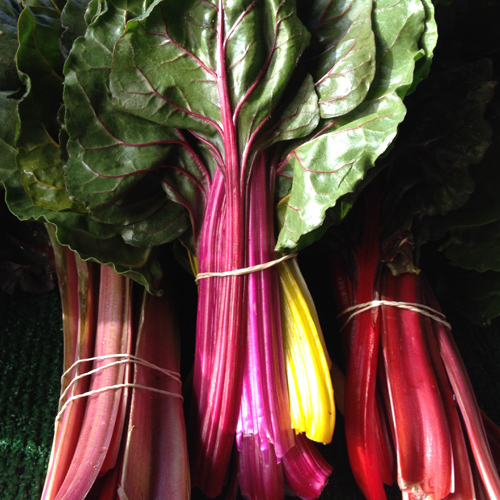 Rainbow Chard - I didn't buy any because I've no idea how to cook it but it's so pretty! 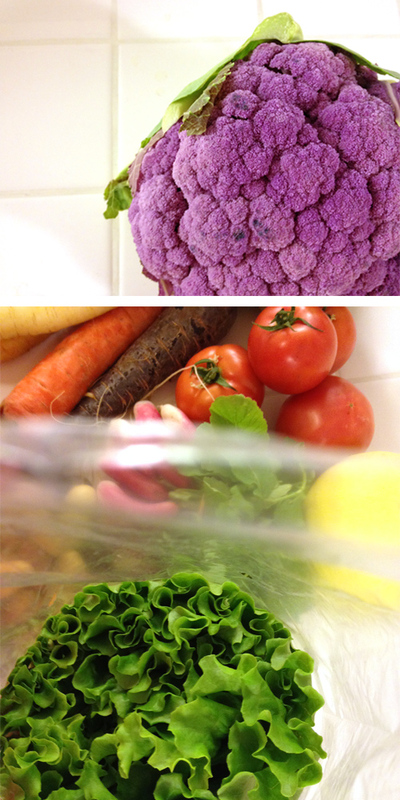 That purple cauliflower is gorgeous!! If you don't already do this, I think you are a prime candidate to join a CSA. 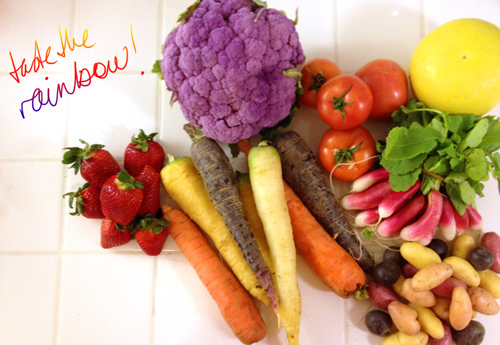 Fresh fruits and veggies delivered to your door each week (or you have to go pick them up at a specific site). My mom belongs to one and she is constantly learning about new vegetables. She has to look up how to cook them because they're often first-times for her. And then she falls in love with all sorts of new delicious healthy foods! purple cauliflower is pretty. but tastes the same as regular. i'll look into that as a possibility of seasonal produce delivery. i'm not sure i'm thaaat adventurous yet!! haven't quite gotten to things like chard or kale. The pictures are amazing! I love fresh veggies. When I have time to get to the shuk here I can get the best stuff. and there you can have all/most of the prepared food cos it's kosher, much more fun!